On November 15, the Chesapeake Regional Tech Council held an educational program on Insider Threat. The topic of the panel discussion included upcoming Federal rules, key elements of an Insider Threat program and privacy, due process and human resource requirements. Tanager’s Mike Miller, Co-Founder of the National Insider Threat Special Interest Group (NITSIG) and VP, Insider Threat was joined by Shawn Thompson, Insider Threat Risk Mitigation Expert/Lawyer/Author, Founder and President, Insider Threat Management Group and Keith Moulsdale, Partner and Co-Chair for Cybersecurity, Information Management & Privacy, Whiteford Taylor & Preston. The panel moderator was Chuck Ames, Director of Cybersecurity, MD Department of Information Technology. Chuck Ames (Director of Cyber Security at the Maryland Department of Information Technology) opens the forum. 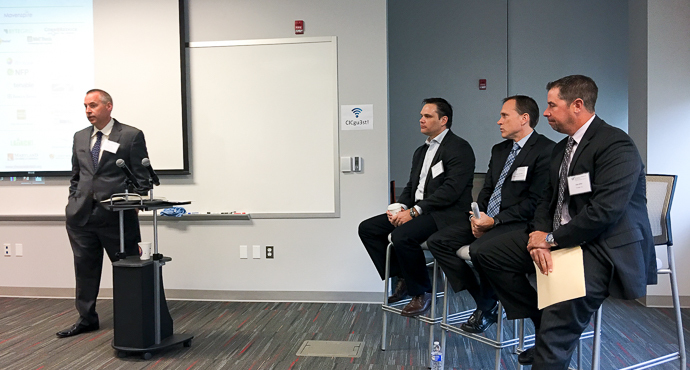 Panelists include Shawn Thompson (founder and president, Insider Threat Management Group), Keith Moulsdale (Whiteford Taylor & Preston), and Mike Miller (VP Insider Threat, Tanager). Photo by the CyberWire. The panel covered topics including the NISPOM Change 2 requirements for Insider Threat Mitigation, how industry is, or is not, addressing the problem and some of the legal aspects involved in maintaining an Insider Threat program. The Chesapeake Regional Tech Council energizes and propels the advancement of technologies with the exchange of ideas, expertise, and business and partnership opportunities. Founded in 1992, formerly the Anne Arundel Tech Council, the Chesapeake Regional Tech Council is a nonprofit 501c6 membership organization supported by grants from the Maryland Department of Business and Economic Development and from the Anne Arundel Economic Development Corporation and enabled by sponsorship’s from our Titanium and Platinum sustaining sponsors and membership.